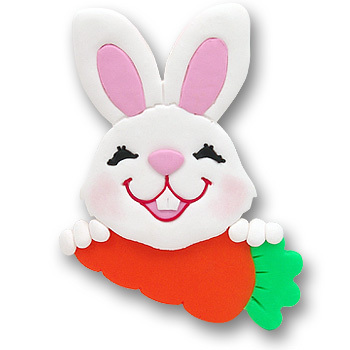 This adorable little rabbit will be a great addition to anyone's Easter Tree. Although it may be personalized, it looks great without it. If you do choose to personalize it, the carrot is the perfect spot and has plenty of room no matter what size name you choose to put on it. Mr. Easter Bunny is handmade from polymer clay and designed by Debi Allison. It is an ornament and comes complete with a hook and satin ribbon for hanging.